We’ve set up a studio workspace in Lee’s apartment in Echo Park (Boy Manor) that acts as a make-shift zine factory with a risograph printer, paper-cutter, and sewing machine. Lee Noble: “Battle Burger” by Jon Vermilyea is really doing it for me right now. Amy Fortunato: I’m a fan of Brendan Monroe’s “Islands”, and recently picked up a zine from 5x7books (http://5x7books.com) based out of Chicago. I also way into Public Collectors, by Marc Fischer. Oops…now we’ve listed four! LN: Waste no time, make something immediately, avoid white computer paper. LN: We booked our first gallery show because of a zine we made! AF: Friends! 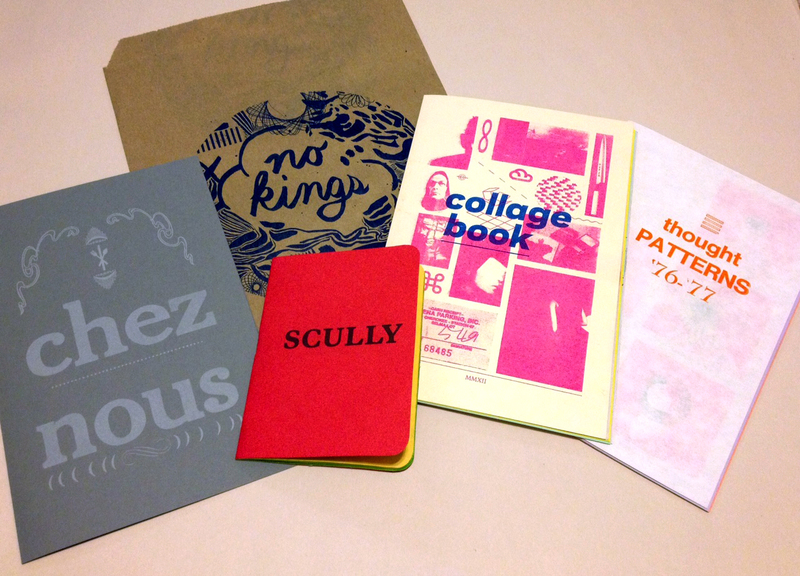 Zines have been a great way of sharing a love of creative process, and meeting people who have similar interests. Also, I was super pumped to be able to contribute to LAZF this year by designing materials to promote it! Amy Fortunato is the amazing artist responsible for our 2013 design! You can see her and Lee’s work at table #11, or check out the No Kings website here. < Get to Know Your Reading: 100 Issues of Ker-Bloom!